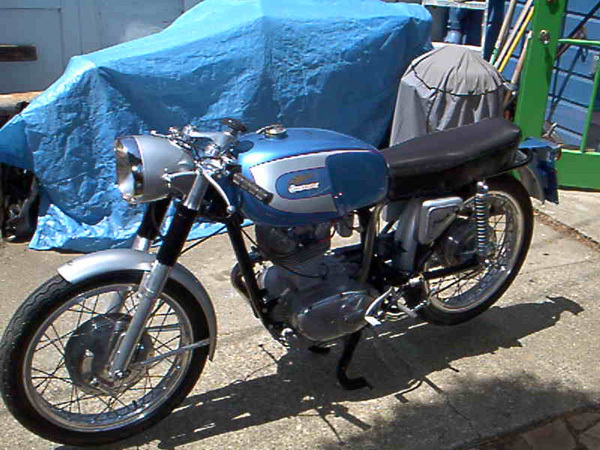 1965 Ducati 250 Mk 3, 5-speed motorcycle. Purchased in 1991 and restored during the mid-late 1990s. Immediately following restoration I rode it up Mt. 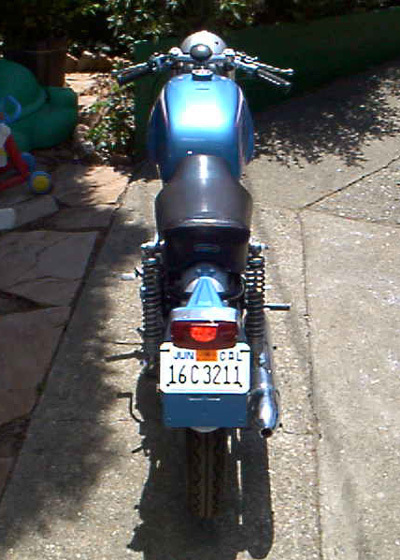 Tam for the Easter ride (1997), started it and rode it for a few blocks every few months, then parked it in my living room for the last two years (after draining carb and tank). Following is a list of the NOS or other parts. PAINT - beautiful job by Rand Dobleman, only one tiny scratch near the fuel filler cap that can be rubbed out. Fuel tank has not been Kreemed (I didnt' want to damage the paint) though there appears to be very little rust. MOTOR - REAL NOS Ducati PARTS ONLY, NO REPRO or aftermarket stuff. New bearings, camshaft, valves, guides, piston, seal, o-ring, gaskets. Cam followers resurfaced by Megacycle. Lightly polished covers. Dell'orto SSI 27mm carb with velocity stack. New Silentium exhaust system. WHEELS - Borrani WM1 front, WM1 rear, Avon Roadrunner 80/90 H18 front and 90/90 H18 rear in race compound, hubs lightly polished. SEAT - original, only shows the beginning of a few cracks in the finish. ETC. 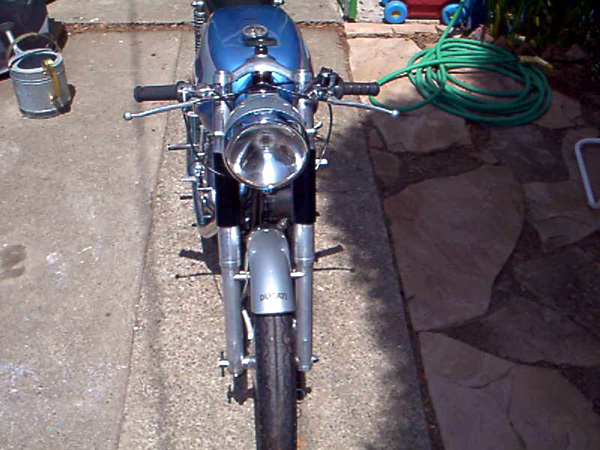 - original hard to find clip-on levers and factory rear-sets, headlamp lens (with the Aprilia dog). 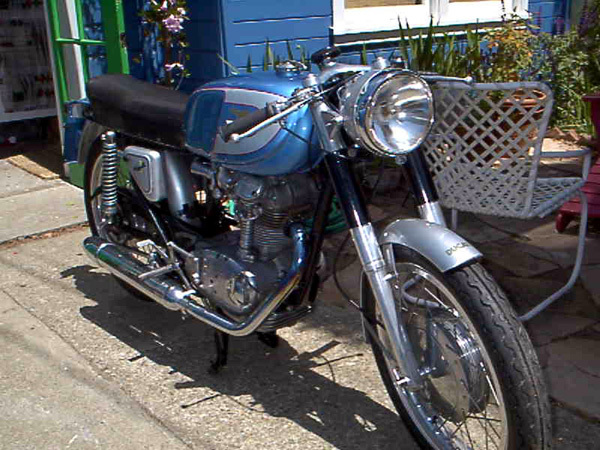 The kickstart lever is a reproduction I purchased from Road and Race in Australia - it bent almost immediately so I usually push start the bike (easy). New chain, sprocket. All new cables. ELECTRICAL - wiring harness is home made following the diagram on page 34 of the Clymer manual; it's a magneto set up (NOS magneto) identical to the one illustrated on page 133 of Mick Walker's Ducati Singles Restoration. Works well though the harness I made isn't immaculate like the paint and motor. All new NOS switches.